I’m now in Dakar, the starting point of my journey. I’m sat on the roof of the hotel, nice a cool now that it’s dusk. I flew from Heathrow after a night spent on the terminal floor. I was able to fly with my bicycle in a big plastic bag. Air France made me sign a waiver form for it’s safety! The plane was delayed for 1 hour taking off (security problems with a piece of luggage that had to be removed). When we arrived, at about 21:30, the airport seemed overwhelmed. I queued for about 2 hours to get a visa. It was taking about 10 minutes per person, with 5 people working for a full 777 jet! I collected my luggage, it all looked fine, but the bike bag looked a bit battered. This was a hassle, there were so many people offering assistance/help, some official for a job, some official soliciting bribes, and some unofficial. I managed to fend them all off. The taxi driver was waiting outside for me, organised by the hotel. This is definitely the way to do it. I would not want to try and negotiate for a ride with all my baggage and all the hassle. Made it to the hotel by about midnight. Nice place but turned out I’d not been specific enough about the room and was paying more than I wanted to. Looked over the bike, I had to remove the front forks for the plane because it’s so tall, I’d forgotten to take out the top headset bearing cartridge, it had fallen out but very luckilly was just loose in the bag. I will pack that part better next time. The rear rack has taken some damage, the extension on the back is slightly bent along with one of the rack stays, but only slightly. It must have taken some force though to damage it like it did. Good thing it didnt buckle! Am staying a second night in Dakar, but in a cheaper room in the same place. 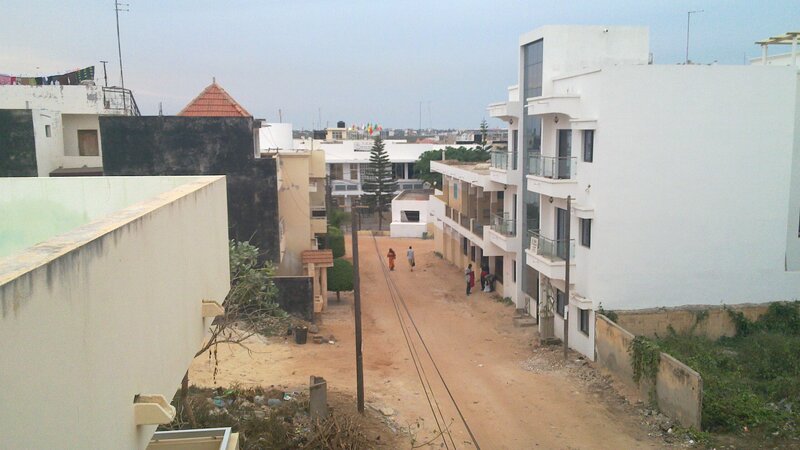 Dakar seems nice, I’ve walked around the suburb I’m staying in, got some food, petrol for the stove, cash from the ATM. I’ll go out for dinner later at a place I spotted earlier. I’m not a great fan of cities, I much prefer rural areas. Tomorrow I leave, heading east for Thies. I think it will take a couple of days. The aim is to get well clear of the city and find somewhere to stay. I’m excited! This entry was posted in Uncategorized, West Africa on December 5, 2013 by Matt. WoohOO! You’re there! Glad to here the bike made it.